After dipping into our first jar of Russian caviar last month, I was curious to try out the other offerings from my Russian supplier. When I had the idea of bringing a nice tin of premium caviar to Last Minute Uncle as a gift on my trip back home last weekend, I decided to get some for myself, too. I wanted to do a side-by-side tasting and see what the difference was... besides the price, that is. I was due to visit my godson Bear today, and as I know Babu is a big fan of caviar - and had in fact ordered a bunch of it from my Russian supplier - I figured I'd bring the good stuff over along with a bottle of bubbly. After all, weekend afternoons are the best time to enjoy this! Russian malossol oscietra caviar - the control sample, the same type we had last month. Unfortunately some of the eggs had burst, maybe due to temperature changes during transport. Russian golden oscietra caviar - the luxurious harvest, and certainly the most I've ever paid for caviar. A rare treat that came at about 3 times the price of the regular, low-salt oscietra. Right off the bat there seemed to be a world of difference between the two. The "golden" oscietra was indeed a lighter color, not quite "golden" but definitely greenish brown, more translucent and reflecting more light. The eggs were noticeably smaller. They just looked more luxurious. The regular oscietra was much as it was last time... less salted, showing more of the smoky flavors. The membranes were still thicker and tougher, making it harder to pop them by squishing them against the roof of my mouth with my tongue. Nice creamy flavors once they were popped, though. The golden oscietra was a completely different animal. First of all the membranes were much, much thinner - and in that sense a lot more like most of the sturgeon caviar I had tried. They were very delicate and easy to pop in the mouth, yielding with little force from my tongue. The level of salt was much higher, and again this was similar to the other caviar I have had. But more than just the salt, the flavors were also more complex, with some "fishiness" as well as some green, almost kelp-like flavors. There was no question which was the finer product. We brought along some Japanese milk toast, which we lighted toasted, and spread some unsalted Beurre d'Isigny on top to go along with the caviar. 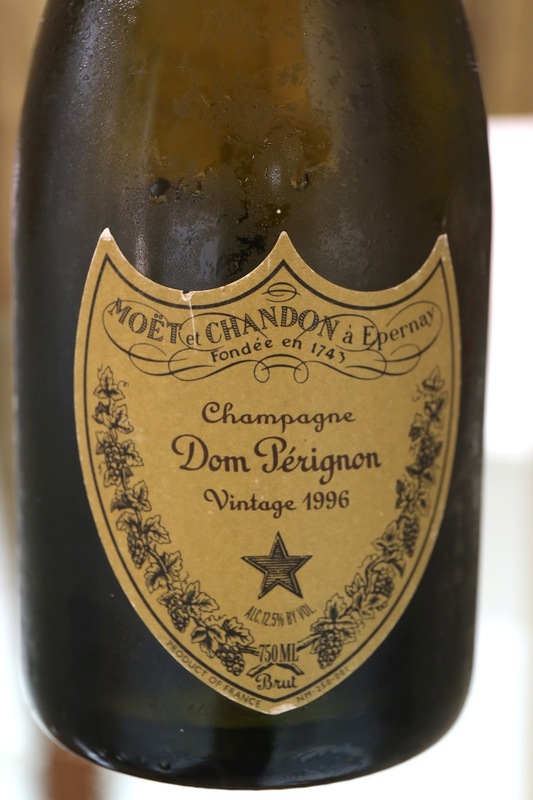 1996 Moët et Chandon Cuvée Dom Pérignon - this has always been a vintage that drank well, even at a young age. Now almost 20 years old, this tasted a lot more mature than I remembered. Very well-balanced between the ripeness and the acidity on the palate. Wonderful. A decadent "afternoon tea", for sure, but it was my way of showing Babu and Mrs. Tigger how much I missed them.